Fink Analog Audio CS2-FA Dual Tube-Channel Strip / Preamp / Equalizer. Just QCd by Dennis Fink! Please note this is an open box item that was used for demos. Two Complete Channel strips - ready for Dual Mono or Stereo linked use. You can track two different mics through it, or record a stereo pair with it. Loop through it during mix down for that great real analog'plug-in' times two. Link it in stereo and you got a Bus Processor for vocals, instruments, or percussion groups; or use it as an analog stereo Mastering Processor. A three tube preamp in the vintage Putnam console style, with continuous Gain and Level controls. A passive parametric three-band EQ in the classic Pultec style, with all the familiar frequencies and curves. A unique two tube implementation of the UREI 1176, preserving the FET attenuator character and controls of the original. Bandwidth 10Hz to 50kHz, +/- 1dB. Input Pad 0, -10, -20, -30dB, Line. Gain Control +/- 10 dB continuous. Level Control 0 to 11. Low boost 0 to +10dB. Low Cut 0 to -10dB. Low Freq 0, 40Hz, 80Hz, 160Hz, 250Hz. Mid Boost 0 to +10dB. Mid Q 1 to 10. Mid Freq 2k, 3k, 5k, 7k, 10k, 15kHz. High Cut 0 to -10dB. High Freq 5k, 10k, 15kHz. Makup Gain -inf to +20dB. Input Control 0 to 11. Output Control 0 to 11. Ratio 1, SOFT, 4, 8, 12, 20, ALL. Attack 0.2 to 20 msec. Chassis 2U x 15.25 deep. Power 20 Watts at 120/240 Vac. Block Diagram - 1 of 2 Channels. This Block diagram shows the signal flow and control positions for each of the 2 channels. Note that the Limiter Bypass switch disable the Input and Output level controls as is expected for a hard bypass. Channel Strip Module - Initial Setup. There are 4 controls that affect the gain structure. They are Gain, Level, Input and Output and should be set to the 1 o'clock position. Set the EQ Bypass switch to OUT, the Limiter Bypass switch to OUT, and the Ratio switch to 1. Set the Input Switch to select the proper source and then adjust the 4 gain structure controls for desired output level. The XLR input on the back accepts Line of Mic signals and is attenuated by the input pad. The Preamp Section controls are used to select the source, pad it, and set operating level. Note that the'Line' position of the Input Select is about -38dB and can be used to attenuate any signal on the input XLR (as is the case with 0, -10, -20 and -30). The EQ section controls adjust the 3 bands: a Mid Boost bell shaped curve, a High Bank roll-off, and a Low Band Boost and Cut shelf. The Limiter section controls set the Limiter functions and the meter display. The Input control sets the threshols, and the Output control provides make-up gain. The'Soft' Ratio position is a custom soft knee setting, and'ALL' is like the mash all buttons on an 1176. Unfortunately, this product is excluded from any coupon code promotions. THE MOST COMPLETE MUSIC STORE IN THE WORLD. The Most Complete Music Store In The World, Period. BEST OFFERS - Please submit offers directly using the "make an offer" button. We will consider your offer as soon as it is received. We will then either accept, decline, or counter accordingly. Please do not send a message or call Alto Music in regards to best offers. If a specific listing of ours does not include the "make an offer" button, we are then currently not accepting anything less than the BIN price for that particular item. 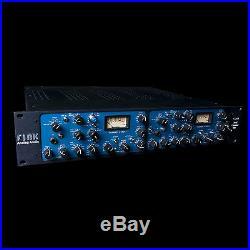 The item "Fink Analog Audio CS2-FA Dual Tube-Channel Strip / Preamp / Equalizer" is in sale since Thursday, October 20, 2016. This item is in the category "Musical Instruments & Gear\Pro Audio Equipment\Signal Processors/Rack Effects". The seller is "altomusic" and is located in Middletown, New York. This item can be shipped to United States.